Learning to read can be a frustrating process for both kids and parents. So far I’ve taught 5 of my 6 kids to read, and every time it goes something like this…. or, upon seeing the first letter of a word is M, like this: “map! man! mix!” (all while staring at the ceiling instead of at the words in front of them. Luckily- practice makes perfect. 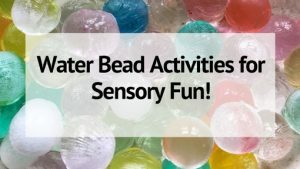 And there are a lot more fun way to practice reading words than flash cards or lists! 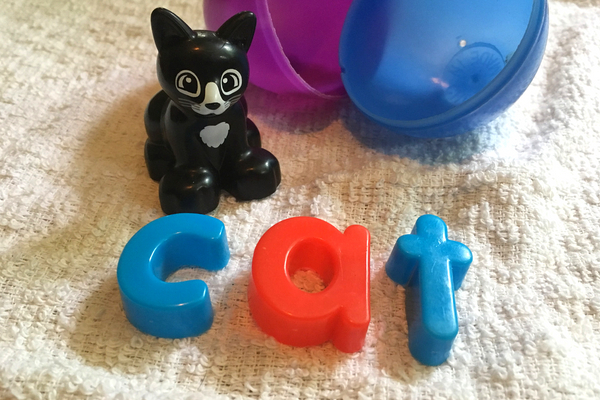 Here’s a simple CVC word activity that will engage your young reader. What I like most about this reading activity is that it is somewhat independent. You can set up your young reader with 5 or so eggs (or more depending on their level and attention span) and allow them to work through the words on their own. 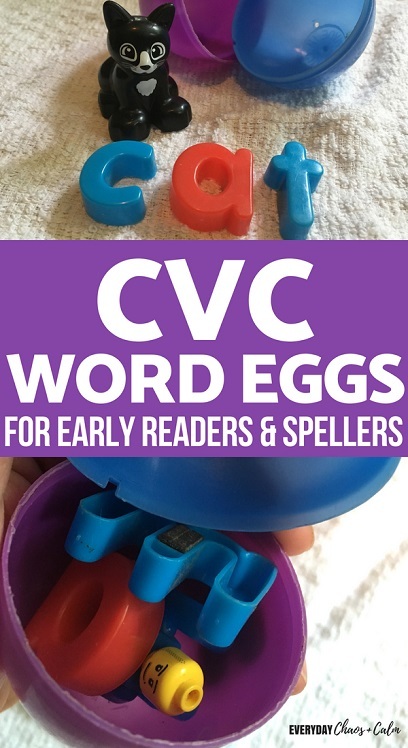 To create each egg you will need a small object to represent the CVC word your child should read/spell. And the corresponding letters for the word. 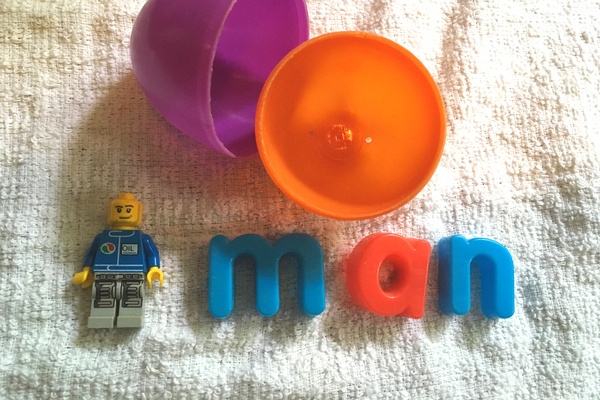 For example, in the picture above we have a MAN and the letters m, a, and n. All of these objects go inside the egg. 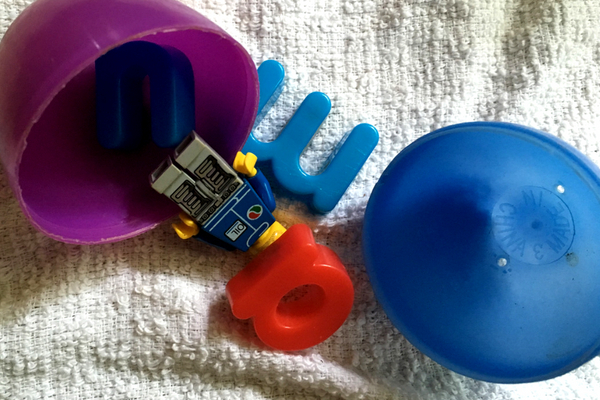 Depending on your child’s level, you may want to make this a self correcting activity by placing a slip of paper with the word written correctly on it inside the egg. This way he can check his spelling and make sure he is correct. Continue making eggs until you have a set- I’d say at least 5, if you are working with a brand new reader. More if your child has a little more experience. If you have a hard time finding actual objects for your words, you can print out pictures of the words instead. 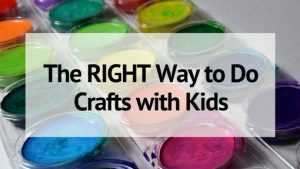 Place all of the eggs in a basket and set your child up on a tray or on a mat on the floor. This helps to define his work space. 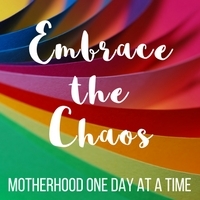 Stay near in case you child gets frustrated, but allow time for him to work out each of the words on his own. He’ll feel much more pride if he completes the set on his own. 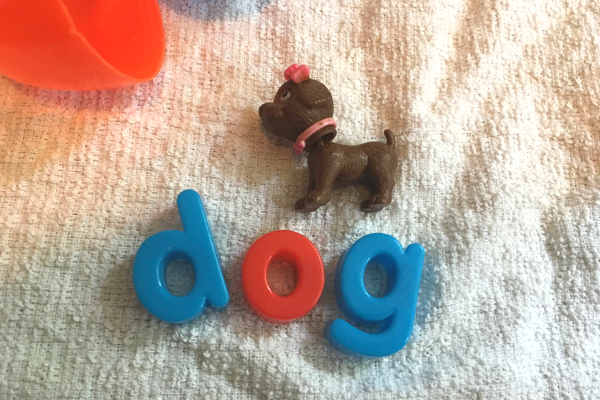 What I like about this activity is that it not only helps with early reading skill, but also spelling. You child has to sound out each sound of the word and place it in the correct order. 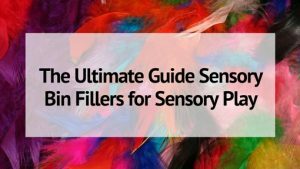 There is a sensory aspect to this activity that will help cement the skills and words as your child uses his hands to build words with the letters.